Being fond of ice-creams is something almost every girl nods her head to. So has been my case for as long as I can remember. However, what I cannot come to understand is, why do ice-creams need eggs or egg yolks? Ever since I shed my ignorance and started to really read the ingredients at the back of the carton, my chief complaint about ice-creams here in the US is that majority of them contain eggs. And those that do without them are dosed with plenty of corn starch and High Fructose corn syrup to make me queasy about buying them. For an ice cream lover, it is a difficult dilemma to be in. Since then, I have wanted to make my own ice-cream. As the mercury began to rise this summer, my little girl and I started making all kinds of plans for some home made ice-cream, something with strawberries and raspberries and such. The plan remained a plan. 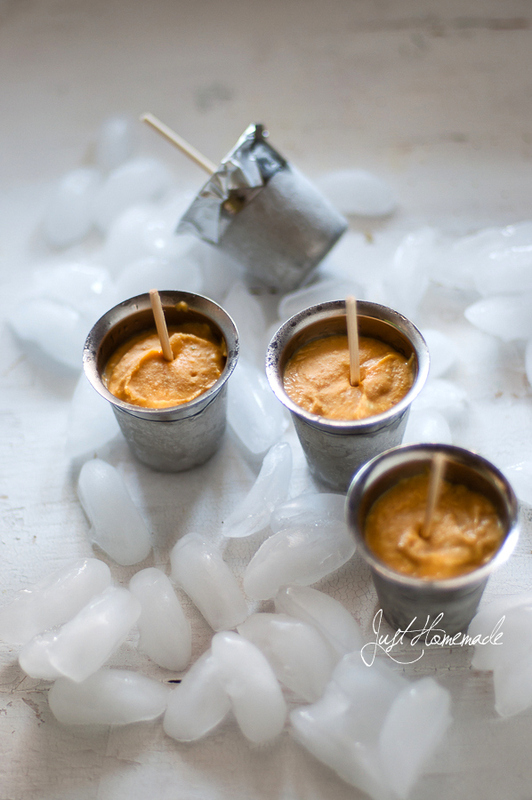 Until one day in late June, when I was suddenly struck with the idea of making Kulfi with this ridiculously simple and amazing Carrot Kheer that my blogger friend Deesha got me hooked on to a while back. I fell in love with it and had made it several times over and over again for ourselves, for friends and at any chance I had got to make something sweet. I knew it would be great. And the thought of Kulfis fit in just right. As it turns out, Kulfi – our very own Indian ice-cream which I did not realize for a long time (!) are super easy to make. No fancy ice-cream maker, no churning, no nothing. Just what my lazy bones were looking for. I will warn you that this Kulfi is rich. Rich, creamy, dense, nutty and full of flavor. What’s a Kulfi if it is not rich, right? And I bet, no one can tell there’s carrots in it! Wash, peel and slice the carrots into 1/4 inch rounds. Pressure cook carrots and almonds in just enough water to cover them or cook on stove top until soft. When cooled, puree cooked carrots and almonds in a blender. Bring milk to a boil in a heavy bottom saucepan. Squish saffron between your fingertips, sprinkle it into the boiling milk. Stir in the carrot-almond puree and simmer stirring intermittently (to avoid scorching at the bottom) until it reduces to about half, about 25 mins. Empty the condensed milk into the saucepan, stir to mix well and simmer for another 5 mins. Switch off the stove and keep the saucepan aside. Garnish with grated or crushed pistachios, stir and let cool to room temperature. Cut the bamboo skewers into 3 parts. Repeat with the rest. Pour the kulfi mix into each of the lotas. Wrap with aluminium foil. Stick the cut skewers in the middle of the foil and wrap the foil in the lota / cup with the stick dipping into kulfi. Place in the freezer for at least 4-6 hours or overnight. To unmold, dunk the lota in a cup of room temperature water for a couple of mins. Twist the stick to unmold. Enjoy! This Kulfi is super delicious and rich. If you would prefer to have it lighter, here are a few things you could try: Substitute whole milk with 2% or 1% and just use half the can of sweetened condensed milk. You might have to adjust the sugar. Keep the whole milk but skip the sweetened condensed milk and add sugar instead. Always wash the top of the can and towel dry it before using. You could use any popsicle mold of your choice. I prefer steel cups to plastic molds. Chin, So happy to see you stopped by. I missed that so much! Thank you sweet Swathi 🙂 Glad you like the twist! It is worth a try..
Lovely that this doesn’t need an ice cream maker. Any idea how to make a lactose free version? I haven’t used lactose free milk. But, I presume you could substitute the milk in the recipe with lactose free milk and skip the condensed milk plus add sugar. That should work? This sounds amazing! I would have never paired carrot and ice-cream myself, but this sounds and looks delicious. I’d love to try making the carrot kheer too! Beautiful pics. Don’t mind eggs in ice cream (it’s the custard base) but do mind the nasty fructose and starch. Thanks Sally. Being a vegetarian, it becomes hard to find something without eggs as well as the nasty substitutes. Kind of Devil or the deep sea! Great idea, im definetly going to try this. My little boy hates carrots and this might be a good way to get him to eat it :). Never thought of using the muffin pan..thanks for the tip, that will save me some mess. You know what Shruti, kids are the toughest critics. Please come back and tell me what his verdict is! I am going to make this in the weekend. I am sure both Saanvi and Poorvi will love it. I haven’t made kulfi yet in my house, but as you said it, it’s super easy and less trouble then the western ice cream. I am so excited, your recipe is beautiful! NOT ONLY CUTE…IT MUST BE SO GOOD!! WE LOVE IT! The pictures are so beautiful! And this recipe of kufli sounds wonderful. As I was traveling in India I tried once cardamon kufli. It was so tasty. It is great to get recipe how to make a kufli! I will definitely try your recipe. I am going to follow your blog, for sure! I just started with blogging about food and photography. Can I put your link on my blog? Thank you for your lovely words.. This world is such a small place sometimes, right? Happy to hear about your Kulfi experience in India.. Hope you’ll try this recipe and like it..
wow! that blue is so cool I’d rather eat that blue ice than the kulfi! …….just kidding. Whaat is this radheakka? You are in a modren age and that too in Amrika and you are still cooking in steel lotas? …………wonly joking. But seriously….the picture at the top is beautiful…yes, “beautiful”! I love that blue! Steel lotas must be the new chic in Amrika. I dare you to publish this comment. Mmmm I bet you could make a vegan version with coconut milk that would be delicious! I’m sure it will be super delicious with coconut milk subbed for dairy in this recipe. I would love to try it myself! Looks lovely Radhika the pic thats a cool blue! I also have started making my own ice cream at home. Sky is really the limit and there are so many flavours to try out again and again! Thanks Shoba. True. Do you use an ice cream maker? Wow! Great recipe and amazing pics. Thanks for sharing. I had never heard of Kulfi before until reading this. What a neat idea to put it in candle holders. If I weren’t lactose intolerant I’d give it a try, but I think I’ll try this for guests. Your photography is amazing! It also helps that the food you take pictures of is so colorful and inviting! Thanks for sharing! Very interesting recipe. Haven’t heard of carrots in ice cream before but this sounds delicious! I tried this recipe for a diwali potluck last night and it tastes absolutely delicious! I used organic purple carrots and it was the best dessert I have ever made! Thanks for sharing the recipe! Awesome! Sindhu.. I have a soft corner for Purple carrots.. I’m sure they made it taste exquisite! I tried it today,it was very tasty and yummy. Everyone in the house liked it. Thanks for giving a good receipe.